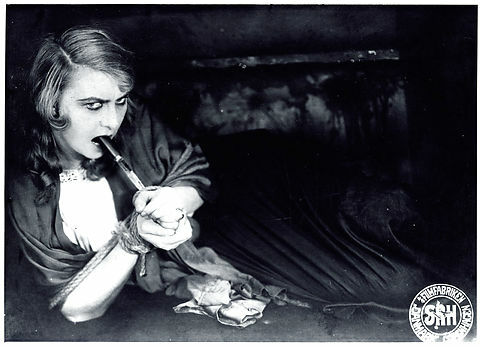 Emilie Sannom, daredevil of the movies | Silents, Please! In the history of film, the 1910s was the premier decade for female action stars. Long before Ellen Ripley became the prototype for the modern female badass, silent movie screens were filled with fearless women, female daredevils, adventurers and spies. Women flew through the air, rappelled down cliffs, solved mysteries (or committed crimes), climbed and swam. 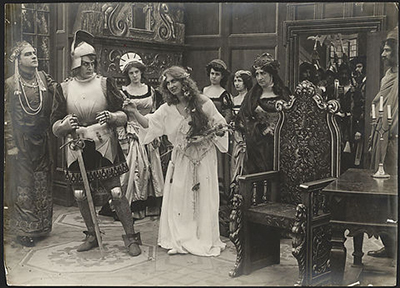 American serial queens like Pearl White, Kathlyn Williams, and Helen Holmes were huge box office draws; Annette Kellerman scandalized and tantalized audiences in A Daughter of the Gods (1914). In France, Josette Andriot donned a black bodystocking to play Zigomar (1911-13) and Protéa (1913-19), and Musidora played the iconic role of Irma Vep in Les Vampires (1915-16). Fern Andra was a circus-film star in Germany, and Astrea was reportedly something of an Italian ‘strongwoman’; Cristina Ruspoli played arch-criminal Filibus with her dirigible. One might also mention two hit circus films made in Italy and directed by Dane Alfred Lind, Il jockey della morte and Il circo della morte, which prominently featured an acrobat known only as Miss Evelyn. 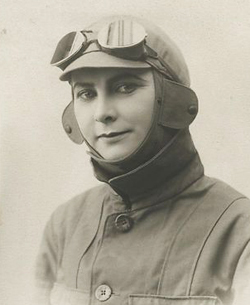 Another of these athletic heroines was Emilie Sannom, a Danish actress, stuntwoman and parachutist. I first came across her several years ago via Filmens vovehals | Daredevil of the Movies (1923), which was then available at Europa Film Treasures (RIP). This video, one of only a handful of Sannom’s surviving titles, is something of a showreel for her very impressive stuntwork. Mostly forgotten today and with little information about her readily available in English, I wanted to make Sannom more visible by writing up (and illustrating) some information about her life and film career. Emilie Sannom was born on the 29th of September, 1886. Before the First World War, Denmark was one of the main film centres of Europe, and Sannom entered films just as Danish cinema was in its ascendancy. Her earliest known film roles came in several 1909 releases by Biorama; the next year, she appeared in Biorama’s København ved Nat | Copenhagen by Night (1910), a film which survives and which I have seen, but in truth, I can’t remember her presence in it. However, that same year she also appeared in a film that would have a monumental impact on the European film industry: Afgrunden | The Abyss (aka The Woman Always Pays; Kosmorama). This was, of course, Asta Nielsen’s sensational film début, directed by her partner Urban Gad. 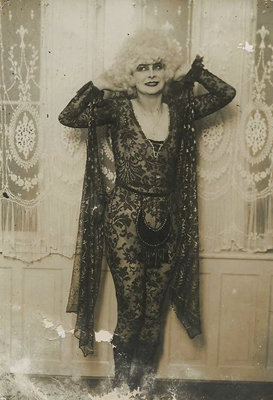 Sannom played the supporting role of Lilly d’Estrelle, a variety singer who is Magda’s love rival; the two women get into a scrap on stage after Lilly flirts with Magda’s lover Rudolph. Lilly shares a moment with Rudolph; an altercation between the two women. Sannom (left) and Asta Nielsen in Balletdanserinden (1911). 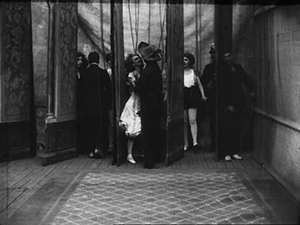 Sannom also appeared in another Asta Nielsen film, Balletdanserinden | The Ballet Dancer (Nordisk, 1911). However, among Sannom’s sixteen films that year, the most important was Hamlet (also Nordisk), in which she played Ophelia. Though the film is apparently lost today, a review in the American film periodical Moving Picture World noted, “Fraulein Sannom makes a very beautiful Northland Ophelia; she seems a true princess; but on the screen she is perhaps more poetic than mad. In other words, she wasn’t as pathetic as she might have been.” This seems to suggest that Sannom underplayed the role; in any case, the review concludes by stating that all of the acting is “very intelligent and dramatic”. Sannom’s films quickly began to showcase her athleticism and daring. Production stills from Sannnom’s mid-teens films frequently show her in action: scaling walls, riding horses, performing in daring costumes, escaping from a locked trunk. Now working for Filmfabriken Danmark, Sannom was promoted as the ‘daredevil of the movies’, and much was made of her stuntwork. For example, in Zigo (1914), we see Sannom walk along a row of spikes, rotating on the tip of one; in Zigeuneren Raphael, she wields a knife. A tale of dogged perseverance that from threatened poverty, by strenuous effort, wins through to honour and reward. Malice and vengeance are ranged against the hero, and elements themselves conspire to his defeat, but he triumphs in the end, aided by the bravery and devotion of a woman whose sympathy he had awakened. Now free, Kitty runs to the jetty, grabs a boat and rows full-speed to the burning lighthouse, and rescues Tom before the dynamite at the base of the lighthouse detonates. Meanwhile, the smugglers are still at large, and the windmill is on fire, the unoiled axles having become overheated and caught ablaze. The story dictates that the smugglers, their dynamite, and the burning mill all converge, but all ends well—the smugglers are rescued and put in the clink before the windmill, too, blows up. Nitrate decomposition heightens the tension. Although this dramatization of the film sometimes describes Kitty in stereotypical ways, it certainly shows her resourcefulness. And while Tom is nominally the hero according to writer Owen Garth, it’s clear that Sannom is the real star of the film: Kitty saves the day in dramatic fashion while Tom plays the traditional damsel role, complete with the trope of being trapped in a tower. Sannom played a female detective in Nattens datter | Daughter of the Darkness (1915), a film which sparked three sequels over the next two years. (Unfortunately, only Nattens datter III is known to survive). The first Nattens datter film looks to have contained plenty of thrills: stills show Sannom riding a motorcycle, swordfighting with another woman, and wearing an incredible stage outfit with half-moon crotch decoration. Great outfit … or best outfit? 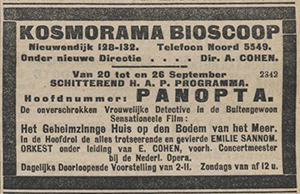 In 1918 Sannom took on her most famous role: lady detective Panopta, who, like ‘Nattens datter’, appeared in a quartet of films. Each instalment saw Panopta pitted against criminal mastermind Kippy, a kidnapper and all-around criminal with an underwater lair. The first two episodes were adapted from novel(s?) by the improbably named Zilva Bébé, and concerned the kidnapping of Maud, a millionaire heiress. Panopta II—subtitled Rædselshuset paa Søens Bund, ‘The House of Terror at the Bottom of the Lake’—saw Sannom don a bathing suit in order to carry out aquatic reconnaissance. Sannom as Panopta; the second picture shows her in drag. The adventures continued in 1919, with Panopta III (Taarnets Hemmelighed, ‘The Secret of the Tower’) and Panopta IV (Da Taarnklokken styrtede ned, ‘As the Tower Bell Crashed Down’). No idea if this is the tower in question, but it looks appropriately secretive. 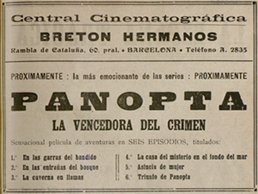 Nieuw Israelietisch weekblad (Amsterdam), 20 Sep 1918; El mundo cinematografico – Edicion Popular no. 49 (Barcelona), 17 May 1918. After the Panopta series, Sannom made a couple of films in Germany (one of which, incidentally, co-starred Bela Lugosi). Her last film was La fanciulla dell’aria | Mistress of the Sky (1923), an Italian film directed by fellow Dane Alfred Lind, and featured Sannom performing a series of audacious airplane and parachuting stunts. 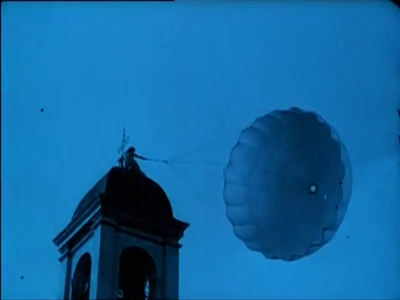 After her film career tapered off, Sannom continued to work as a parachutist and aerial performer. 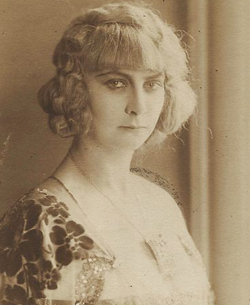 She never married, although, like Asta Nielsen, she had a child out of wedlock. Sannom’s life abruptly ended at an airshow in 1931, when her parachute did not release; she plummeted several hundred metres to the ground and was killed instantly. 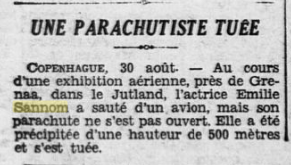 A newspaper report of her death from French newspaper L’Ouest-Éclair, 31 August 1931. Films of the teens starring such ‘adventure women’ often cut both ways—on one hand, they are a realisation of female power in a previously male sphere; on the other hand, there’s the fact that the audience is encouraged to take pleasure from women’s endangerment. Emilie Sannom’s stunt work is still astounding today, breathtaking in its daring, but she is also notable for her self-possession and often rather severe facial expression. We have little footage to go by, it’s true, but it’s difficult to imagine Sannom screaming in terror, and she was clearly no coquette; thus, when she puts her body on display in a skimpy swimsuit as Panopta, there is less of a sense of allure or titillation than there might be. There is a certain coolness to this risk-taking ‘daredevil of the movies’. Given her real-life love of parachuting and aerial aerobatics, it’s not hard to imagine that for Sannom, filmmaking was a means to an end rather than her life’s calling. Filmens vovehals [Daredevil of the Movies], 1923. Compilation reel containing clips from the Filmfabriken Danmark films Pigen fra Hidalgo-Fyret | The Girl from Hidalgo (1914), Diligencekusken fra San-Hilo | The Stagecoach Driver from San-Hilo (1914), Zigo (1914), For Barnets Skyld | For the Child’s Sake (1915), Panopta II (1918), Panopta IV (1919), and the Alfred Lind-directed Italian film La fanciulla dell’aria | Mistress of the Sky (1923). Available to watch here on the European Film Gateway. This entry was posted in Film and tagged adventure, Alfred Lind, Asta Nielsen, athletic heroines, cinema of 1923, cinema of Denmark, cinema of Italy, EFG, Emilie Sannom, excellent women, forgotten film stars, original research, serials. Bookmark the permalink. I guess I am interested some esoteric stuff, and if I don’t write about it, who will? :) And thanks! Fascinating post! I’ll be looking out for her work form now on. I also loved an enjoyed this wonderful compilation. And thumb up for your work again!